Home Ecommerce Platform Are Your Cross-sells Killing Conversion? It’s generally believed that product recommendations on ecommerce sites increase conversion and average order value. But according to e-tailing group’s 16th Annual Merchant Survey, 59% of retailers don’t know what kind of conversion rates they achieve when shoppers preview upsells or cross-sells on product pages. When you consider that 9% don’t use such merchandising, that adjusts to 65% of those that do. And cart pages are not far behind. With so many retailers not measuring the effectiveness of product recommendations, we can imagine how few are testing and optimizing their performance. The performance of your recommendations merchandising depends on how they are tuned and when and where you display them. 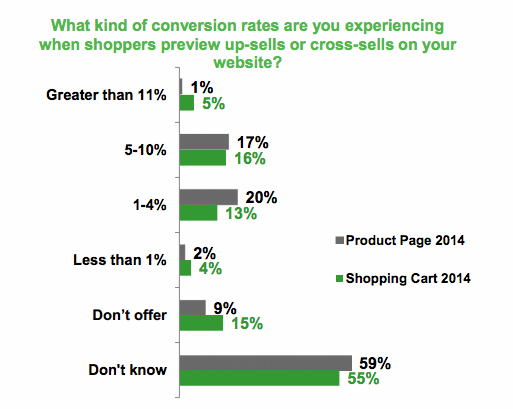 Would you know if cross-sells were actually lowering conversion on your site? Product recommendations can take several forms, from simply displaying more items from the same category / keyword match, to complementary items (cross-sells), upsells (more expensive version of same item, or bundle) or affinity items (people who viewed/bought also viewed/bought). Your choice of what type of suggestions and where they’re placed impacts their success. What’s your product page conversion goal? The primary success metric on a product page isn’t conversion, it’s a successful “add to cart.” If the customer decides the product is not worth adding to cart, the secondary goal is to offer navigation tools and merchandising that prevents site abandonment. Showing “more like this” to keep the customer exploring supports this secondary goal. But we know about the paradox of choice, that satisfaction and actual choice decrease the more similar options we present to a customer. More choice increases the need to “think” and slows down the decision making process, increasing the chance of abandonment. The placement, assortment and labelling of product recommendations may actually be working against the primary goal. Showing very similar products to the one being viewed, above the fold, may encourage pogo-sticking behavior which can lead to distraction or indecision. 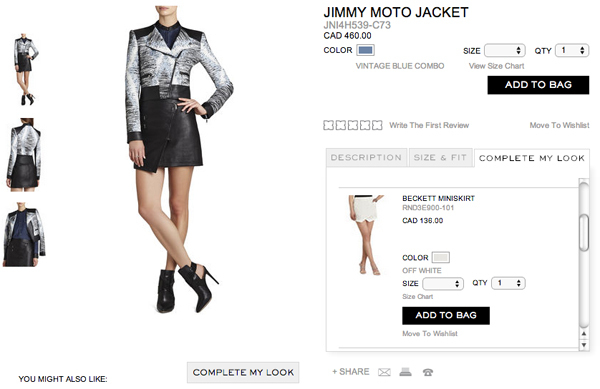 And in some cases, lower priced alternatives that would lower cart total are prominently displayed. In the example above, moving suggestions below product information interferes less with product evaluation. Customers that still want to look around after viewing the main product can still find them, but they don’t compete with product content. A useful A/B/C test would be the above control (A) against no recommendations (B) and recommendations placed further down the page (C). Because this page’s strategy is to show “more like this,” KPIs to measure would be add-to-cart rate (for product), page abandonment rate, attachment rate (for product suggestion), conversion rate, and revenue. You want to measure both distraction and the likelihood that a customer navigating away from a product page ultimately makes a purchase. Cross-sells are a bit different than “more like this.” Showing items from other categories on a product page asks the customer to switch mental gears from the type of product originally sought (e.g. customer came looking for winter boots) to another category all together. If cross-sells attract a click, they interrupt that decision making process, unless the customer was truly just browsing. 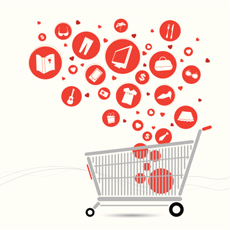 Most merchandisers use cross-sells with hopes of increasing basket size, but they may be more appropriately offered after an item is added to cart, either through an interstitial, or in the cart itself, unless presented on the product page in a “usable” way that prevents pogo-sticking between pages. A useful test, if your tools allow, is to run “more like this” against cross-sell assortments. Ideally this test is run after an initial “ideal placement” test as described in the previous section. It’s a good idea to observe category-by-category which recommendations perform best. Your optimal merchandising strategy may be different for Suits than Ties, for example. You may want to segment and test further within the category, bucketing by sales volume. Amazon.com, for example, merchandises “also viewed” on high-ticket men’s suits, and “who bought also bought” for lower priced ones. “Customers who bought also bought” recommendations will be more relevant the more sales data you have. Not enough good data leads to head-scratching suggestions like bright pink children’s Crocs bought together with a sleek, leather Women’s Calvin Klein boot. “Also viewed” or “More like this” may be a more appropriate population strategy for all but the highest moving items. 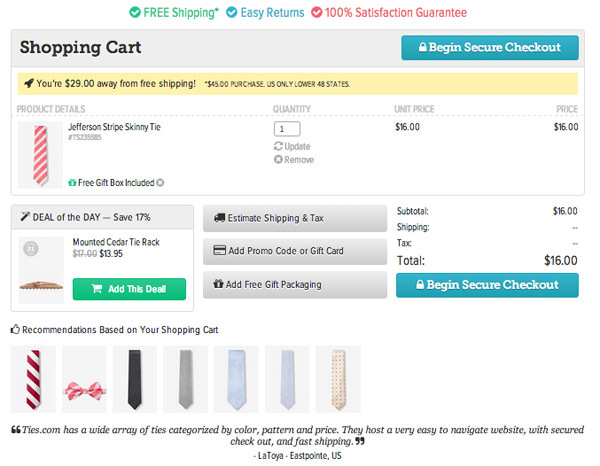 Some e-tailers have designed their product pages so that multiple items can be added to cart. Best Buy supports add-to-cart directly from the accessories tab, which is fitting for the electronics category, though testing this against an “unhidden” approach may provide better attachment rates. 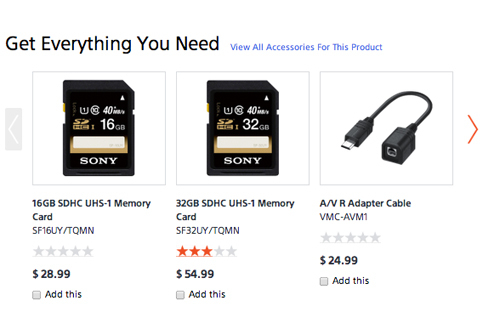 Sony embeds a carousel with checkboxes to add directly to cart. 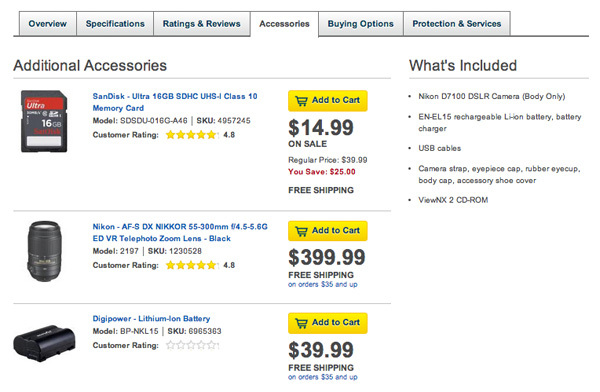 On some product pages, Sears offers the option to customize a own bundle of recommended products. This is likely to be more successful if the products are well-understood and don’t require a click-through to make a purchase decision. 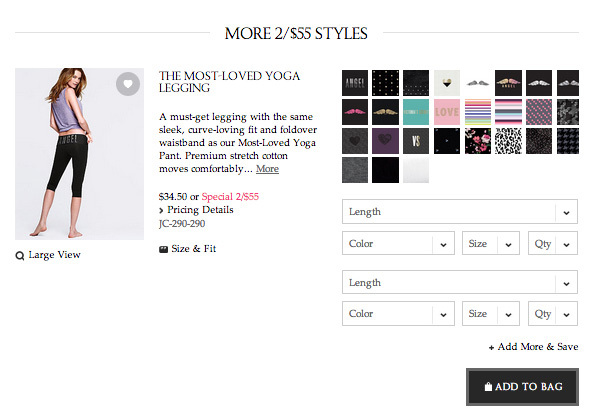 Victoria’s Secret enables full product configuration (size/color/quantity) within product pages, so entire looks can be purchased without losing place. 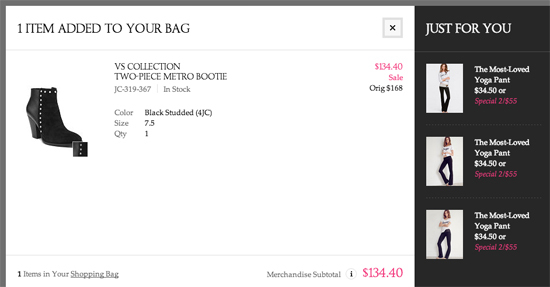 BCBG shows shop-the-look items in a scrolling frame. 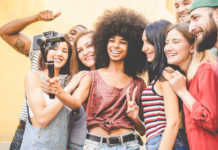 Any or all of these approaches may be tested against the traditional way of showing cross-sells, and of course, against showing no cross-sells on the product page and using interstitials or cart merchandising. Victoria’s Secret uses a large lightbox to show cart contents and suggest more to explore (unfortunately this example shows 3 of the same item). Ties.com embeds a “deal of the day” in the cart, as well as merchandises similar items. The product page’s job is not to increase basket size, it’s to get that one product in the basket, and failing that, a secondary goal is to show the customer something interesting and relevant enough to keep them from bailing your site all together. 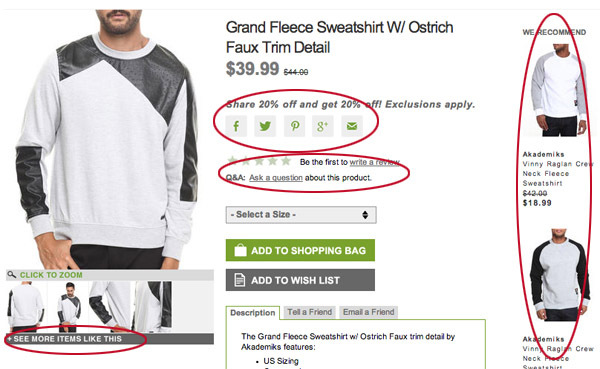 Keep this in mind when developing and testing your merchandising strategies on product pages. 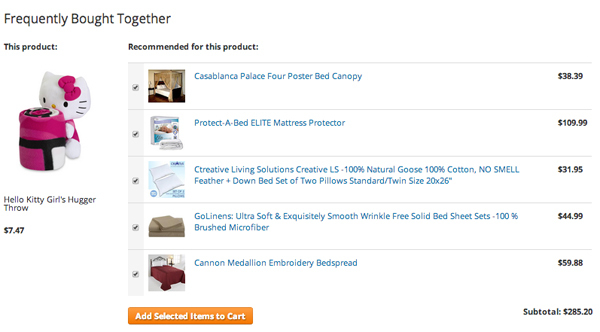 The exception to the above is if/when multiple items can be added to cart from a single product page. This may be more appropriate for certain product types than others, and should be tested for usability as well as A/B tested, not just for design but also the rules that populate suggestions. Different products warrant different merchandising strategies. Segment test results by product category, price point, sales volume, etc. Challenge assumptions and test assortments, price points, placement, design and labels of recommendations. Cross-sells may be more appropriately displayed in interstitials and cart pages than product pages. Test to see if that’s true for your site.